Founded by Picens and founded again by Siracusans according to Old Plinio, Numana was already an important trading port on the Athenian and Greek routes in VI cent. b.C. Conquered by Romans, became municipium conserving a certain importance in the trades. With the end of the empire it knew the devastation of the Goths and an unforgettable earthquake that it made to sink in sea half of lived (558 a.D.). In the Middle Ages Numana knew a period of decline due to repeated pillages of bandits and earthquakes (terrible that one in 846). Subsequently it made part of the Papal State until its annexation the Reign of Italy (1860). During the '900, thanks to the tourism, the village of fishermen of Numana has transformed in important tourist locality of the Conero. 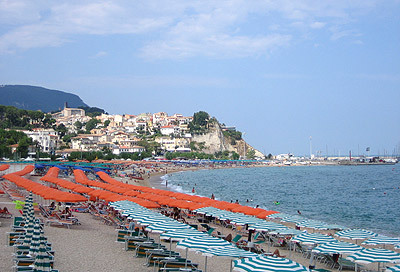 Numana is located inside of the Conero Park and is today an important bathing tourist center famous for the beauty of its sea and its beach. The city is able however to offer to its visitor also l artistic starting points like the Antiquarium, that collects archaeological finds of the Picen civilization, or the Tower, symbol of the city and witness of a remote past. It seems possible that it was the bell tower of the ancient Church of San Giovanni, destroyed by the earthquake in 846. Other monuments are Fontana Morelli ('600) and Palazzo Vescovile (1773). Numana keeps an important wooden crucifix that tradition dates a little after Christ's death. Surely the crucifix was already famous during the Franks age and was conserved in the Church of San Giovanni. As a result of the eartquake (846) was found again in the sea in 1294 by some fishermen.